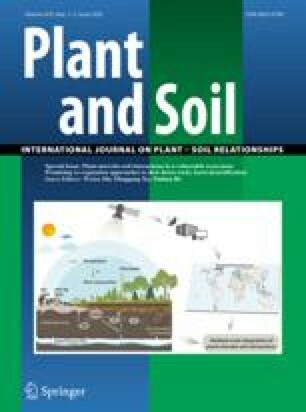 The processes responsible for maintenance of cation-anion balance in plants and their relation to active ion accumulation and changes in rhizosphere pH are outlined and discussed. The major processes involved are: (1) accumulation and degradation of organic acids which occur in the plant mainly as organic acid anions (and their transfer within the plant) and (2) extrusion of H+ or OH− into the rhizosphere. The relative importance of the two processes is determined by the size of the excess anion or cation uptake. Indeed, plants typically absorb unequal quantities of nutritive cations (NH4++Ca2++ Mg2++K++Na+) and anions (NO3−+Cl−+SO42−+H2PO4−) and charge balance is maintained by excretion of an amount of H+ or OH− which is stoichiometrically equal to the respective excess cation or anion uptake. The mechanisms and processes by which H+ and in particular OH− ions are excreted in response to unequal cation-anion uptake are, however, poorly understood. The contemporary view is that primary active extrusion of H+, catalyzed by a membrane-located ATPase, is the major driving force for secondary transport of cations and anions across the plasma membrane. However, the fact that net OH− extrusion often occurs (since excess anion absorption commonly takes place) implies there is a yet-to-be characterized OH− ion efflux mechanism at the plasma membrane that is associated with anion uptake. There is, therefore, a need for future studies of the uptake mechanisms and stoichiometry of anion uptake; particularly that of NO3− which is often the predominant anion absorbed. Another related phenonenon which requires detailed study in terms of cation-anion balance is localized rhizosphere acidification which can occur in response to deficiencies of Fe and P.